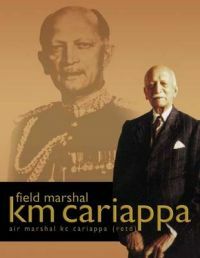 In "Field Marshal KM Cariappa", Air Marshal KC Cariappa (retd), the airman-son presents the lesser-known face of a disciplinarian, yet loving father who tried to ensure that his son and daughter grew up well despite the absence of a mother; who wished his son to follow in his footsteps, before conceding that 'The Air Force needs a few good chaps tool' He allowed his daughter to drive his Plymouth that no one else was permitted to touch. To help him meet the demands made of him by his profession, he counted on his siblings and nieces. Fond of reading, sports and music, he was a great success with children and had deep admiration for the apostle of nonviolence - Mahatma Gandhi.During Field Marshal KM Cariappa's illustrious career in the Army spanning over three decades (1918-1953), he had a series of firsts to his credit: the first Kodava to join the first batch of Indian cadets at the Daly College, Indore, from where he was commissioned; the first Indian Officer to enter Staff College, Quetta; the first Indian Brigadier; among the first Indians to enter the Imperial Defence College, UK; the first Indian Major General in 1947; the first Indian Commander-in-Chief. After retiring from the Indian Army in 1953, he served as High Commissioner to Australia and New Zealand till 1956.In 1986, the Government of India conferred the rank of Field Marshal on this outstanding son of the soil.With a strong visual narrative comprising archival matter sourced from private and state-owned archives, "Field Marshal KM Cariappa" is a moving tribute from a son who regrets he was unable to spend more time with his father - the Father of the Indian Army. Air Marshal KC Cariappa (retd) was commissioned into the Indian Air Force in 1957 and posted to No. 20 Squadron where he served for six years. He graduated as a Flying Instructor from the Flying Instructor School in Chennai in November 1963 and served at the Pilots Training Establishment in Allahabad till the outbreak of the 1965 war against Pakistan. On 22 September 1965 he was shot down while carrying out attacks on enemy positions and taken Prisoner of War. He remained in captivity till 22 January 1966. He participated in the Bangladesh War of Independence. For his gallantry he was awarded the Vayu Sena Medal. After the war he reverted to flying fighter aircraft. In 1976 he was appointed to command No. 8 Squadron, one of the oldest in the Indian Air Force. In January 1995 he was awarded the Param Vishist Seva Medal by the President of India for his distinguished services to the Indian Air Force. He retired in January 1996. His hobbies include trekking, angling and involvement with wildlife and environmental activities. He was President of the Coorg Wildlife Society for four years. A keen student of international and military affairs, he has written articles for journals and newspapers on matters pertaining to his interests.